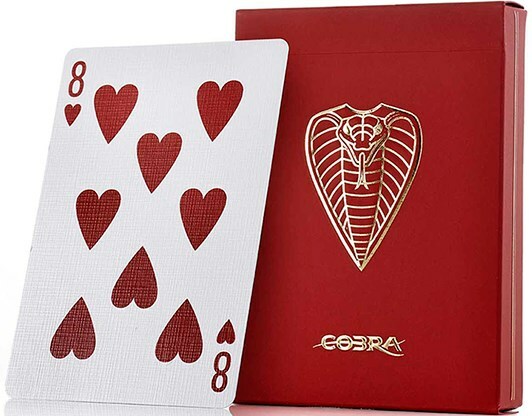 Strike fast or you'll miss out on this gorgeous deck of COBRA Playing Cards! 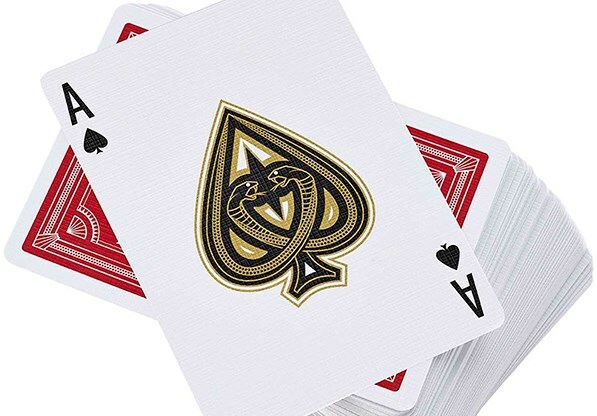 These cards are adorned with gold foil on the backs and court card faces for an elegant look and come with a custom Ace of Spades and Jokers. They are printed on Cartamundi's B9 Cardistry stock for an incredible feel yet exquisite durability and are housed in a tuck case made of soft touch burgundy 330gsm complete with gold foil COBRA logo and detailing. This deck will be a pleasure to hold and behold. Buy your decks today! SUMMARY: A deck potent with venom, yet very playable, purchasable, and lovable! 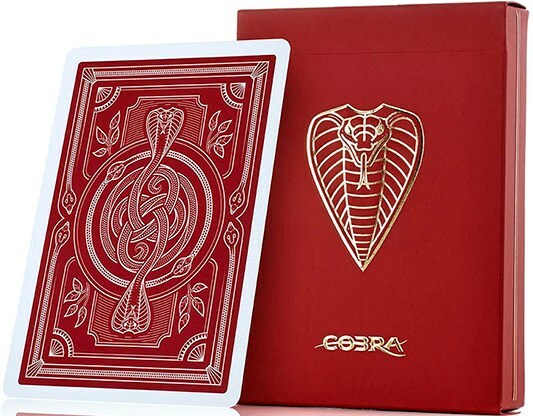 OVERVIEW: Produced by JP Games Ltd, the Cobra Playing Cards deck is going to please almost everyone who likes playing cards, whether as a collector, card player, magician, or card flourisher. These cards have been illustrated by Rick Davidson. He has designed many other amazing decks, including the LUXX Palme and the LUXX Greille, and has done a fantastic job on this deck as well. The theme of course is the cobra, a venomous snake known for responding to threats by rearing up and producing a hood. TUCK BOX: The tuck box for the Cobra deck is a nice burgundy red colour. It has a great tactile feel to it, being soft and smooth to touch, and has been made to be lasting and durable. 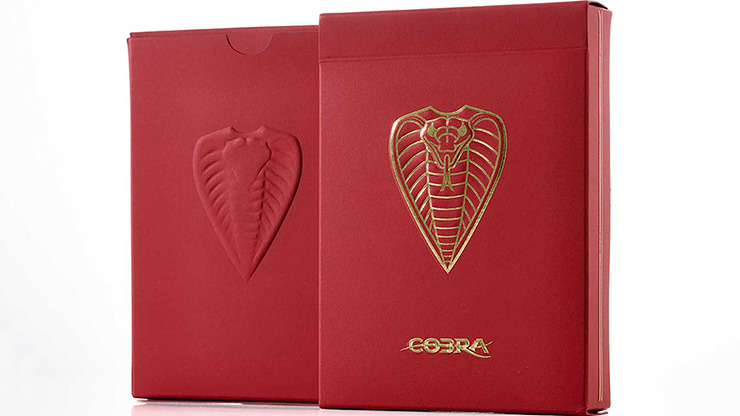 Elegant embossing on both the front and back of the tuck box creates the shape of a cobra rearing up. The embossing job is very well done, with gold foil accents enhancing the cobra on the front of the box. On the front of the box also has the name of the deck - Cobra - in a fancy and elegant gold foil font below. The gold foil looks amazing on the red colour box, and the fact that only a minimal amount has been used helps make it all the more eye-catching and appealing. Also of note is the fact that along the sides of the box there is an embossed gold foil line, which ends in a cobra’s head at the top of the tuck box. BACK DESIGN: The overall design and shapes of the Cobra deck has been inspired by the DCM’s Elites and the Monarchs. For the back design, the primary feature consists of two cobras with their tails entwined and rearing up from the card. Around this are also some cobras biting one another’s tails, while cobras also line the edge of the card. The red of the card back design matches that of the box, which creates internal unity - always a plus for a strong deck design. The borders and circular centre mean that each card has a clear distinction from others, which helps for packet cuts and other cardistry moves. The circular centre helps enhance cardistry moves that involve the turning of cards and packets and creates a central point of focus on the cards. The single colour back design also means that the cards are not distracting for card games or for card magic. The design is still very classy and intricate, yet not too much so that it becomes distracting. It is a perfect combination of class and simplicity. If the design was too intricate it would be too distracting, and yet if it was less customized and designed it would be too boring. This all makes the card back design ideal for the whole range of uses of cards: cardistry, card magic or card Games. COURT CARDS: The faces of the cards are relatively standard, aside for a few modifications to the court cards, the Ace of Spades, and the Jokers. The court cards use a metallic gold ink which keeps them very useable yet adds more class and beauty to the recognizable design. The gold metallic ink used combines with black and red to create a very classy look. ACE OF SPADES: The Ace of Spades is custom and is composed of two cobras rearing up at each other. Once again, gold metallic ink assists to complete a luxurious and stylish look. 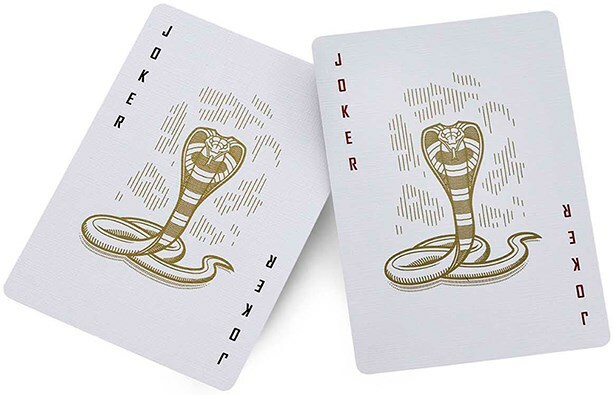 JOKERS: The two Jokers each picture a cobra rearing up, which fits naturally into the theme of the deck, and is perfect touch for this deck. They aren't identical, with the lettering on the one being black, and red on the other. OTHER CUSTOMIZATION: There is some small customization with the pips as well, which are slightly modified and are larger than standard. This makes them much bolder on the card, as they stand out and are more easier noticed. The indices are also very bold and large, making the cards easy to read and ideal for card magic or games, even when holding a large hand of cards. EXTRA CARDS: The deck also comes with a double backer and blank gaff card, both of which are perfect for magicians, and a welcome addition to the deck. CARD QUALITY: The Cobra Playing Cards have been printed by Cartamundi, a large publishing company with an established reputation in publishing games, but which has only recently entered the cardistry and magic communities with high quality decks. These have been printed on the company’s B9 Cardistry stock, which has also been used for the recent and widely hailed Cardistry Touch deck as well as the amazing Butterfly Playing Cards. These cards combine to make up one of the thickest decks I have seen, and yet they are the softest ever. Straight out of the box, these cards handle perfectly, requiring no breaking in whatsoever. Yet the deck has been holding up extremely well so far, and despite fairly intense use it has gone the distance with no obvious signs of wear - a somewhat surprising outcome because usually this proves to be an issue with softer decks. What is also unique about the finish is that the embossing pattern on the card faces is different than the embossing pattern on the card backs, and this allows the cards to slide perfectly over one another for fans and spreads. The cards have a very smooth cut, resulting in perfect and smooth edges, unlike what I've seen with some USPCC cards. All this together makes this deck a privilege to handle, and you won’t stop enjoying using it! 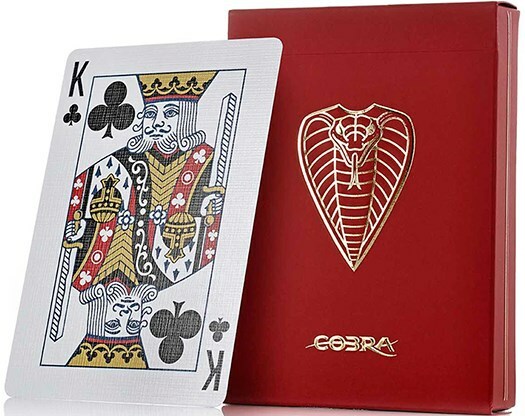 RECOMMENDATION: The Cobra Playing Cards are great for anyone who might need a deck of cards. For magicians it has standard faces and a non-distracting back and handles perfectly straight out of the box. For cardists, it features a super soft stock while still fanning and spreading evenly and smoothly, and it has a clear back design that is ideal for cuts and a circular centre that is ideal for spins and twirling maneuvers. For gamers this deck presents a unique and appealing back design with clear and easy to read faces, and the softness makes it a joy to shuffle. Congratulations Paul Middleton and JP Games on another fantastic and affordable design. Here's hoping that we'll see more predators climbing out of the design box at JP Games. Even venomous creatures can have a soft and appealing side, and it's not hard to love fine playing cards like these.